________Goswami says that Srila Prabhupada told him like that many times. Is this really cent-per-cent true? Swami Narasingha: Hearing this kind of bigoted statement towards Srila Prabhupada’s godbrothers, I don’t know whether to laugh or cry. There is, of course, some truth in __________Goswami’s statement, but it runs along the lines of a half-truth, a half-baked potato, rather than an accurate representation of the facts. Make no mistake about it, Srila Prabhupada did request some of his godbrothers to join him in his preaching mission in the west, even inviting them to be in charge of the temples, which would have become branches of the Sri Mayapura Caitanya (Gaudiya) Matha. Srila Prabhupada wrote to his godbrother, Srila Bhakti Vilasa Tirtha Maharaja, offering respects at his lotus feet and offering him the charge of the future temples in America. Srila Prabhupada wrote to Srila Tirtha Maharaja on October 8th 1965, scarcely one month after his having arrived in the USA. It may also be noted that in that letter to Srila Tirtha Maharaja, Srila Prabhupada requested him to send ten lakhs of rupees via foreign exchange to start the New York temple – which was $150,000 in those days, or the equivalent of 1.5 million dollars by today’s standard. Now can you imagine what the response would be if I, Swami Narasingha, were to write such a letter to the GBC at Mayapura/Kolkata requesting co-operation, asking them to send me 1.5 million dollars so that I could open a preaching centre in Mexico City? I think the response to such a request is obvious – in fact, I doubt that I would even receive a reply. More likely than not, it would simply raise one hell-of-a-laugh! Factually, let us imagine if Srila Tirtha Maharaja had actually accepted our Guru Maharaja’s request back in 1965, then there would be no ISKCON! 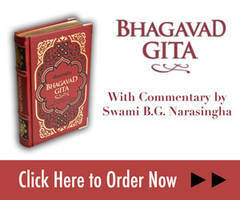 There would simply be no ISKCON! Can you imagine? Yes, that is what would have happened. All the centres in America and around the world would all be branches of Sri Mayapura Caitanya (Gaudiya) Matha and we would all have become disciples of Srila Bhakti Vilasa Tirtha Maharaja and not disciples of Srila A.C. Bhaktivedanta Swami Prabhupada. These generous offers that Srila Prabhupada made to his godbrothers were indeed declined, but when ________Goswami says that the godbrothers responded by saying, “We don’t want to give up our positions. Like in my own matha, I am the acarya and I’d rather, basically be a ‘big fish in a little pond’ and not a ‘little fish in a big pond,” he is simply putting words in the mouths of Srila Prabhupada’s godbrothers that they never said. In fact, the phrase ‘big fish in a small pond and little fish in a big pond’ was not actually in the vocabulary of Srila Prabhupada or his godbrothers. It is purely an American phrase that first came into use in the late 19th century. I doubt that even one of Srila Prabhupada’s godbrothers, or anyone in Gaudiya Matha, ever used that phrase – especially in reply to Srila Prabhupada’s offer of preaching in the west. So rather than fault Srila Tirtha Maharaja for not accepting our Guru Maharaja’s invitation, I think the proper understanding would be to see it as Krsna’s arrangement. Lord Krsna wanted all the glory of spreading Lord Caitanya’s sankirtana movement throughout the world in every town and village to go to His empowered devotee, our Guru Maharaja, Srila A.C. Bhaktivedanta Swami Prabhupada. We should thank our lucky stars for that and not criticise the divine arrangement of Krsna. Another example of Srila Prabhupada requesting a godbrother is that of Srila B.R. Sridhara Maharaja. On numerous occasions Srila Prabhupada wanted to arrange for Srila Sridhara Maharaja’s preaching. Again I will mention that if Srila Prabhupada’s godbrothers had accepted his offer, beginning with Srila Tirtha Maharaja in 1965 and Srila Sridhara Maharaja in 1973 and 1977, or even before when Srila Prabhupada wanted to start another organisation after the breakup of Gaudiya Matha, making Srila Sridhara Maharaja the head, then there may have never been an ISKCON or even disciples of Srila Prabhupada. From my perspective, it appears that the statement of _______Goswami and others of a similar mentality echoes the Judeo-Christian way of thinking. It is ‘judeo’ in the sense that ISKCON leaders are, step by step, turning Srila Prabhupada’s ISKCON into a messianic personality cult. Christians accept that Jesus was crucified to die for their sins, resurrected on the third day and ascended to heaven to sit on the right hand of God, but they reveal their hypocrisy by condemning the Jews for the death of Jesus – without who's death there could never have been salvation for Christians. Similarly, ISKCON’s present leaders like _________Goswami glorify Srila Prabhupada as a pure devotee from birth who singlehandedly, by the desire of Krsna, spread Krsna consciousness around the world, yet at the same time condemn Srila Prabhupada’s godbrothers for not accepting his offer to be the acarya or president, for not accepting the preaching to be done under Sri Mayapura Caitanya (Gaudiya) Matha, and for not cooperating with Srila Prabhupada. 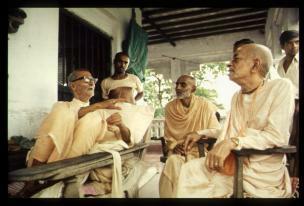 The fact is that some godbrothers did cooperate with Srila Prabhupada – especially Srila Sridhara Maharaja. A small, but significant example of the cooperation between Srila Prabhupada and Srila Sridhara Maharaja, and the high esteem in which Srila Prabhupada held Srila Sridhara Maharaja, can be shown in the following incident. Srila Prabhupada replied, “Sridhara Maharaja should not be bothered with such details. The fact is that simply by his presence here at our temple, everything is auspicious, by his grace! There is no need for him to walk down to the field.” After this, Srila Prabhupada and Srila Sridhara Maharaja sat together on Prabhupada’s verandah and honoured prasadam. By faulting Srila Prabhupada’s godbrothers in the way that ________Goswami has done, many of Srila Prabhupada’s disciples fail to see the arrangement of Krsna. Thus, they reveal themselves to be hypocrites and remain kanistha devotees, or worse still, aparadhis. Furthermore, a consideration that these devotees are self-condemned kanistha-adhikaris is the fact that anyone, after fifty years of devotional service, who continues to think that all the living entities in the material world, in countless numbers of universes, were once pure devotees of Krsna absorbed in love of God eternally in Goloka Vrndavana one day were overcome by lust and became envious of Krsna, and were thus cast down to the worlds of birth, death, old age and disease is clearly a kanistha, despite their having achieved a Phd in Sanskrit and risen to the heights of leadership in ISKCON.